Compliance to anti-glaucoma medications remains a major limiting factor in the management of glaucoma. With old age come physical difficulties in instilling medications, dementia leads to forgetfulness of the doses and the financial constraints in buying medications indefinitely puts a strain on the pocket of old pensioners. In order to overcome the factor of non-compliance to anti-glaucoma medications, sustained release drug delivery systems are being investigated. These long-acting or enhanced delivery systems can be broadly divided into EXTERNAL and INTERNAL platforms, depending upon their location with respect to the coats of the eyeball. 1. PUNCTAL PLUGS= Drug-infused plugs which can be inserted into the punctum are undergoing clinical trials. 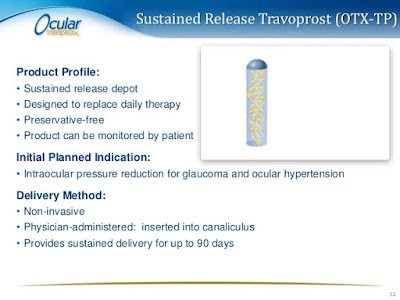 These include the Ocular Therapeutix’s Travoprost (OTX-TP) and the Mati Therapeutic’s Latanoprost plugs. The former is cylindrical while the latter is arrow shaped to prevent inadvertent slippage into the canaliculi. 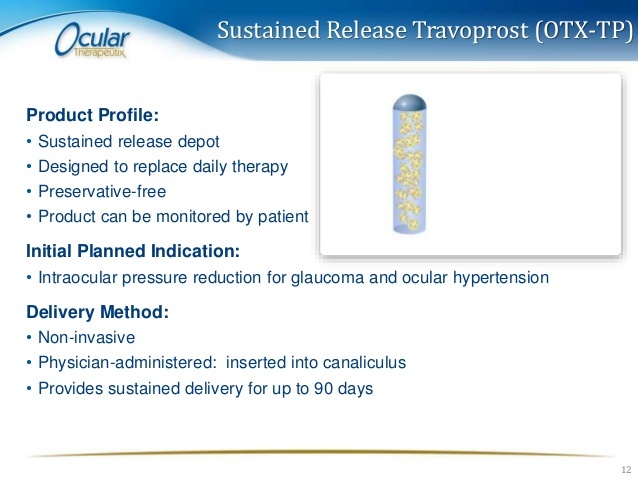 The OTX-TP is expected to provide sustained drug delivery for 2-3 months. With the Mati Therapeutic’s plug, IOP reportedly dropped by 6 mmHg after 1 week. Side effects of plugs include falling out or intra-canalicular migration, local skin darkening near the medial canthus and epiphora due to the plug blocking the punctum. 2. RINGS= A ring, containing Bimatoprost, which fits into the superior and inferior fornices is being developed by Allergan. The retention rate of the ring is reportedly around 90% at 6 months and the efficacy lasts for 4-6 months. The loss of efficacy is presumably due to the elution of the drug with time and the blockage of receptors due to continuous exposure to the drug. 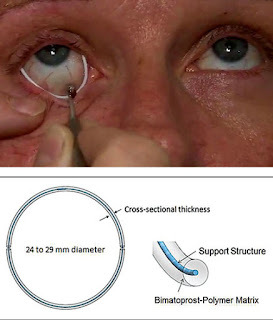 When the ring was re-inserted after 6 months of initial use, the same effectiveness as in the first insertion was not seen, probably due to the down-regulation of the receptors. 3. 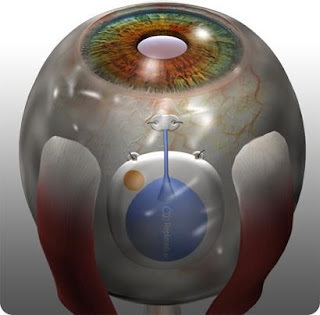 PERIOCULAR INJECTION= A subconjunctival bioerodable pellet containing Latanoprost is being developed. Known as the Durasert, the 3 mm implant is injected using a 27-gauge needle. Pfizer and pSivida are conducting a Phase I/II safety and efficacy trial of the Durasert. 4. 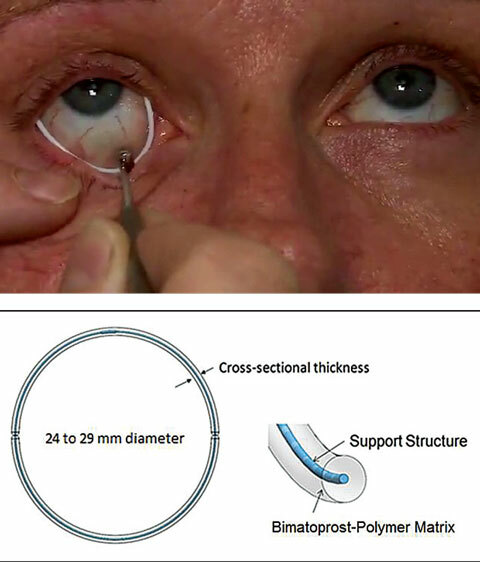 SUBCONJUNCTIVAL INJECTION= Natarajan JV and colleagues reported Latanoprost incorporated into LUVs (Large Unilamellar Vesicles) derived from the liposome of DPPC (di-palmitoyl-phosphatidyl-choline) by a film hydration technique, and injected subconjunctivally. The IOP lowering efficacy of this vehicle was sustained upto 50 days. 5. 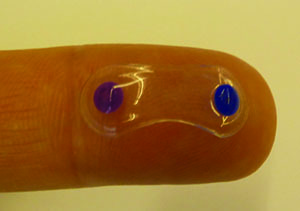 CONTACT LENSES= (a) Latanoprost eluting low dose contact lenses (CLLO) and high dose contact lenses (CLHI) have been produced by encapsulating a thin latanoprost-polymer film within the methafilcon hydrogel lathed into a contact lens. As reported by Ciolino and colleagues in Ophthalmology journal, CLLO reduced IOP by 6.3+/-1.0 (at day 3), 6.7+/- 0.3 (at day 5) and 6.7+/-0.3 (at day 8). The CLHI reduced IOP by 10.5+/-1.4 (at day 3), 11.1+/-4.0 (day 5) and 10.0+/-2.5 (day 8). Topical Latanoprost reduced IOP by 5.4+/-1.0 mmHg on day 3 and 6.6+/-1.3 mmHg on day 5. Thus, sustained delivery of Latanoprost by contact lens was found to be atleast as effective as the topical application. (b) Hiratani and Alvarez-Lorenzo have reported the usage of soft contact lenses consisting of polymers of N,N-diethylacrylamid and methacrylic acid which appear to deliver timolol for approximately 24 hours. 6. 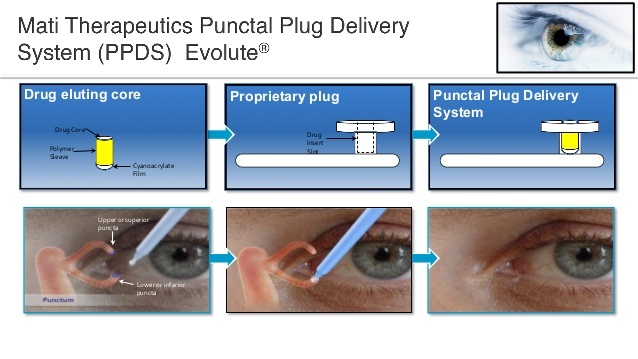 TOPICAL OPHTHALMIC DRUG DELIVERY DEVICE (TODDD) = This device developed by Amorphex Therapeutics has combined polymers which allow sustained release of Timolol. The device is put under the upperlid, where it floats over the tear film. 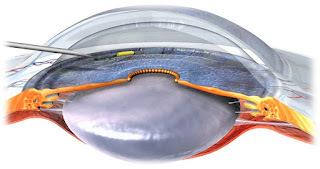 It has a corneal relief curve which prevents it from riding over onto the cornea. IOP was found to be reduced by 16-22%. The company is planning Phase I trials for the TODDD. The device will probably be effective for 90 days. 1. 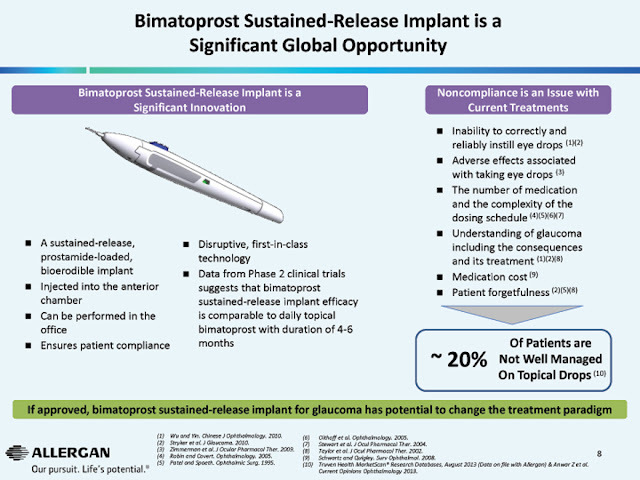 Allergan’s bimatoprost sustained-release implant, which can be injected into the anterior chamber, is undergoing Phase III trials. In Phase II trials it reduced IOP in 92% patients at 4 months and in 71% at 6 months. The pressure lowering was by 8-10 mmHg at week 2, but by week 26 the IOP lowering was by 6-8 mmHg. The advantage of such implants is that there is no risk of dislodgement. 2. 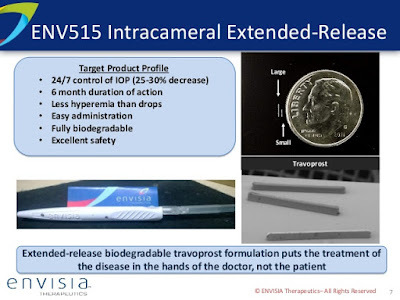 ENV515 (Envisia): This intracameral implant uses Travoprost. It uses a biodegradable polymer drug delivery system. In Phase I trials IOP reduced an average of 35% (6.4+/-0.6 mmHg) over 8 months, but returned to baseline at 9 months. 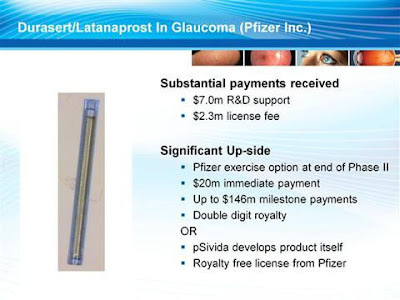 In Phase IIa clinical trials IOP was reduced by 28% (6.7 mmHg) at day 25, which was comparable with instillation of Travatan Z once daily in the other eye. The only side effect noted was transient hyperemia. 3. GrayBug is developing a microparticle technology originally created at the Wilmer Eye Institute. 3 possible agents: a single IOP lowering compound; a dual-action IOP-lowering compound and another IOP-lowering agent with neuroprotective properties, are being developed. The agents will be injected intravitreally or subconjunctivally. The implant would be absorbed over a 6-month period. 4. Clearside Biomedical and Santen are developing a supraciliary drug delivery system using Clearsides’ microinjector and Santen’s sustained release formulations. Sulprostone and Brimonidine were tested with the delivery system and decreased IOP significantly compared to their topical counterparts. In rabbit eyes, a single injection of Brimonidine reduced IOP by 6 mmHg. However, the effect tapered off after a month. 5. Ohr Pharmaceuticals is developing injectable micro- or nano-articles using Latanoprost. The particles can potentially be injected within or around the eye. Adnexal adverse effects do not occur with this agent. However, there is risk of toxicity, damage to intraocular structures and need for lifelong procedures to ensure sustained lowering of IOP. 6. Icon Bioscience is developing a biodegradable injectable implant to deliver Latanoprost. The IBI-60089 is injected intracamerally through a 30G needle. 7. Euclid Systems is developing 2 collagen based systems to provide sustained release of Latanoprost. The first is an injectable insitu gelling collagen solution and the second a 2mm x 4mm collagen wafer implanted over the sclera. The latter has shown the release of Latanoprost to last upto 180 days. 8. 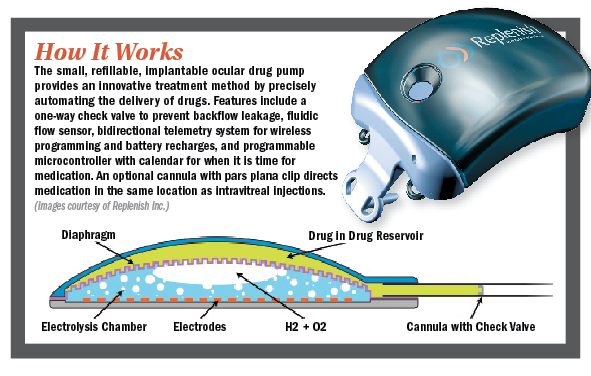 Replenish has developed the Ophthalmic Micropump which is implanted over the sclera. The wireless connected and programmable system dispenses nano-liter sized doses of drugs, which can last upto 12 months. Once the medication is exhausted, the device can be refilled with a 31G needle. Thank you for visiting the "glog ". Thanks for discussing about glaucoma. We all afraid of this disease as it is very dangerous and progress of optic nerve damage is irreversible. I always adopt vision plans for routine follow up of my eyes to prevent such dangerous disease.